The Business Owner's Guide to Telling Stress....BYE! The Business Owner’s Guide to Telling Stress GOODBYE! Stress is defined by the National Institute of Mental Illness (NIMI) as the brain’s response to any demand which can be triggered by just about anything. These include changes that are positive or negative, as well as real or perceived. They may be recurring, short term, or long term and may include things such as preparing for a presentation for a business meeting to obtain potential new partners, loss of employment or new employment, family management, finances, professional and personal relationships, and the list could go on and on for miles. The reality is that stress is something that can be caused by any and everything and affects everyone at some point in their life. Stress causes the body to experience things like insomnia, chronic pain, depression, diabetes, and decreased immune system thus resulting in an increased risk for infections and viruses, as well as hormonal imbalances. As business owners, we don’t have time to allow these things to creep up into our daily routines. With that being said, the million-dollar question that everyone is trying to obtain an answer to is, “How can I alleviate stress?â€ Well, I am happy that you asked that question because I am going to share some actionable steps that you can take RIGHT NOW to be on your way to telling stress…Bye Felicia! Many times, we have to just endure the process because the process has to occur just how it is supposed to occur. Now I know many of us are “fixersâ€ and we want to step in with our flesh and “make it happenâ€ and fix the issue that has gone wrong, but the reality is we are causing undue stress on ourselves from a battle or issue that we have no control over. Yep! Simply deep breathe! I hear you saying, “and what is that going to help?â€ When we take deep breaths it induces the parasympathetic system and slows down your heart rate, which leads to a state of relaxation, which helps to alleviate stress. Exercise is one of the best ways to alleviate stress. So take that brisk 20-minute walk around the community where your office is located, walk the stairs five times during your breaks and lunch that you have to force yourself to take, and complete those everyday activities like cleaning the house, working in your yard, etc. Believe it or not, movement causes the body to go into a state of relaxation. During stressful times our muscles get really tense, which further elevates the level of stress that we are already under. Muscle relaxation is an awesome technique to help alleviate insomnia and chronic pain, which both can be caused by stress. 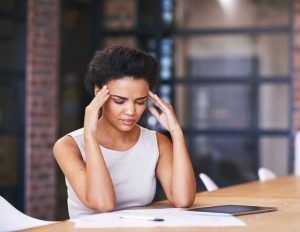 The incorporation of these tips to alleviate stress work–but only if you implement them into your daily routine–so I challenge and encourage you to get on the road to tell stress…Bye!! Do it for your family, friends, health, and more importantly yourself. This article was written by The BOSS Network Influencer, Nicole Thomas. Nicole Thomas is an educator, motivator, and purposeful living enthusiast. She has 11 years of experience in leadership, healthcare management, clinical knowledge, and business acumen. Her mission is to help female healthcare professionals to awaken their God-given purpose as a healthcare professional through education and empowerment through her brands Nicole Thomas INC & Going Beyond The Chart. Nicole earned her Bachelor of Science in Nursing from Southern University A&M College and her Masters of Nursing with a specialization in Nursing Education from Walden University. 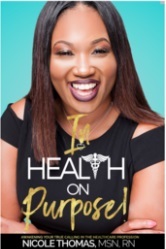 She is currently working on her Doctor of Nursing Practice degreeÂ and is the author ofÂ Â “In Health, On Purpose: Awakening to Your True Calling in The Healthcare Profession”.